Remember a while back when I announced "Attack the Stash?" Well, I decided to call it "Hand-Me-Down REHAB" instead. Hope you all don't mind. 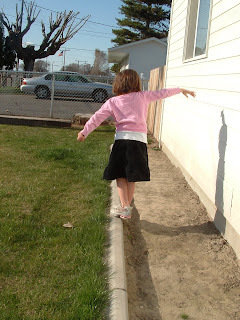 I've been having a lot of fun lately remaking some of my kids old clothes, hand-me-downs, and thrift store finds and have been discovering some cool tricks along the way...probably tricks that have been around as long as I have been, but they're new to me and maybe they will be to you too, so I hope you'll join us and grab a button. 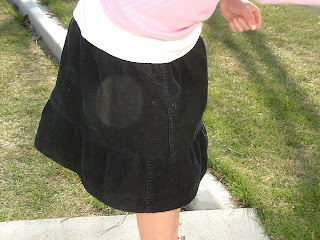 I saw this idea for making a little girl's skirt out of mom's pants legs on The Craft Patch. I thought it was cute, but had no immediate plans for it. 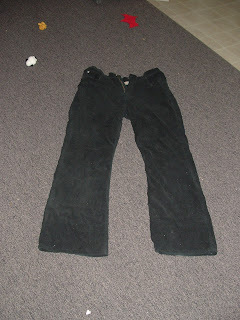 Then this last week a pair of my black cordoroy pants finally got a big hole (they've been wearing thin for a while.) I thought about making skirts out of it and was going to put it in the "maybe I can do something with these" pile. Then I realized that pile was WAY too big, so I jumped right in. 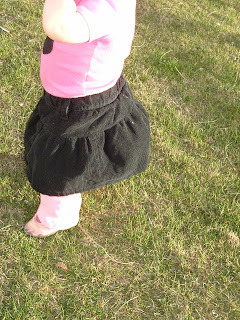 Firecracker loves wearing skirts, but I have a big beef with skirts made for little girls...they're so short! Firecracker grows out of them a full size before other things...meaning she's just starting to wear size 5 clothes...but her size 5 dresses are all too short...so I made her this. 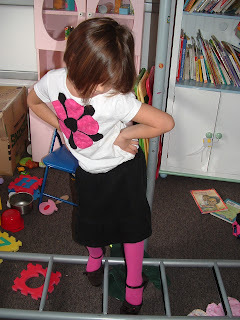 I think little kids dressed up in bold colors are cute, and I LOVE how these skirts turned out. Hubby laughs at me because every time the girls wear them, I can't help but say how cute they look. I kind of made this up as I went along, so I didn't take as good a set of pictures as I would have liked. I'm already half done with doing this to another pair of pants though, so there should be a more detailed tutorial in the works. 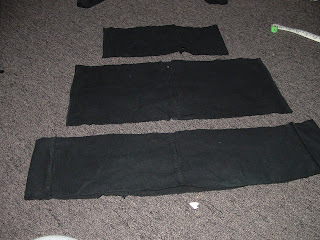 I started with these pants...Strictly between you and me...they're a size 10 and they worked great for making a skirt for my 5 year old...who's about average size for a 5 year old. I decided to make the skirts with ruffled tiers...because it's has straight hems...and is very forgiving...and I was worried I'd get the shape wrong if I tried to angle the sides myself and have it look funny. I trimmed off the hem, and I cut three rings from each leg. The top and bottom rings you see in the picture are the same width (about 5 inches). 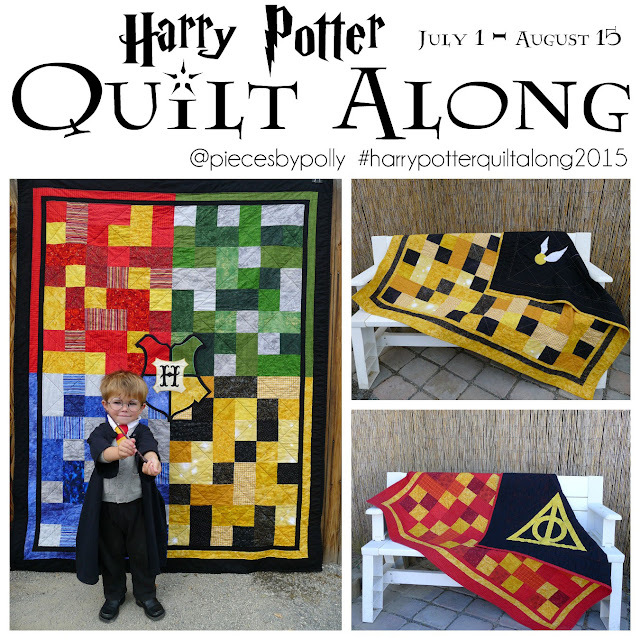 The wider strip is about 8 inches. I took one of the sections from one of the top rings and sewed it with the two strips from the bottom, to make the bottom ruffle in the skirt. The bottom ruffle has 5 sections in it. 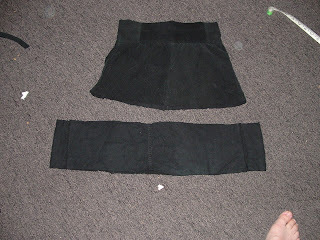 Then sew the remaining sections from the top, to make a three section ring for the top wasteband part of your skirt. Then sew the two middle strips together to make a ring with four sections in it. This way they're each different lenths. Next, I started with the smallest, top ring and folded the top over to make a casing and put elastic through it for the wasteband. 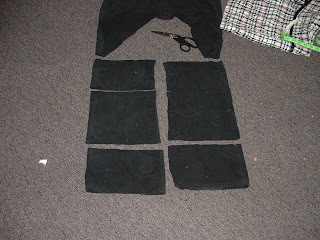 I did this before attaching the rest of the skirt, so there wouldn't be as much bulk to manuever around my machine. Then I hemmed the bottom of the largest ring. 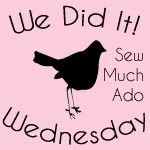 Then I gathered up the top edges of the two largest ruffles and sewed them to the bottom edge of the skirt section above it. The original seams from the pants did not all line up. There's no way to get them to line up, so I off-set them as much as possible to give the skirt more character. That's it. 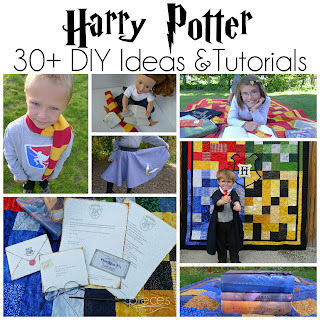 It's all ready for your little girl to prance around. 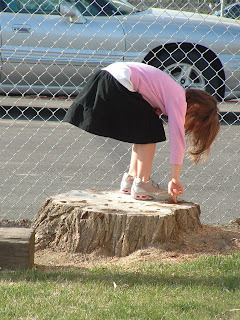 And I love that she can bend all the way over and the skirt is still long enough. 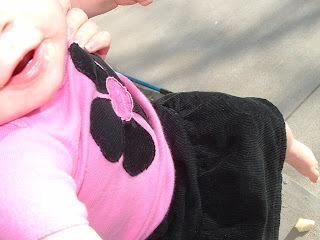 The matching skirt I made for Sweet Pea is a little different and reuses the original waistband from the pants. Those belt loops on that little tummy are so adorable...but that will have to wait for a different post. Got clothes that need a rehab? Join in and grab a button! I'm anxious to see these darling skirts in person! Cute!! I have some khaki pants I might try this with! I totally agree, I love that she can bend over without her undies showing!!! 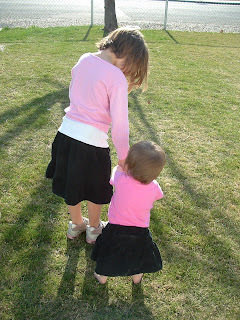 I always make my girls wear shorts under their skirts because they are tomboys who love looking girly lol. Thanks for this super cute idea.